as seen around town... - When pigs fly. ... just imagine what 'bottled exchange student' would taste like! 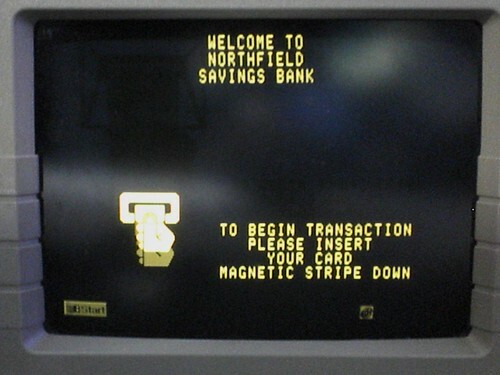 ... yes, that's a Windows XP error on an ATM. ... Hail Who?!? That's a cute advert next to the church! Only in New York City do the graffitists correct spelling. No wonder I like it here! I've seen the windows fault screen before over the years. I have a collection of Windows GP_faults (BSOD) from some of the most unusual places... MTA vending machines, a huge screen in Times Square, flight information boards, public telephones... but an ATM? That's bad. I came sooooo close to posting the "Hail Seitan" ad today. I've accumulated these photos in my phone for the past 10 days. I love taking photos of unusual things. I always laugh whenever I see those Microsoft Windows error messages on screens everywhere. I've seen them at a McDonald's drive-thur and an ATM. I also accidentally figured out how to crash the ATM as well one day. I have 2 checking accounts linked to 1 debit card and whenever you do any transaction it repeatedly asks you which account (1 for this account, 2 for this account). I meant to press 1, but accidentally hit 4 and couldn't figure out how to delete so I just hit the enter button. The ATM then spit out my card and became unresponsive for 5 minutes.